But often also a source of frustration. irritations and loss of turnover. That’s why this e-book offers you 15 concrete tips to transform issues into profit. 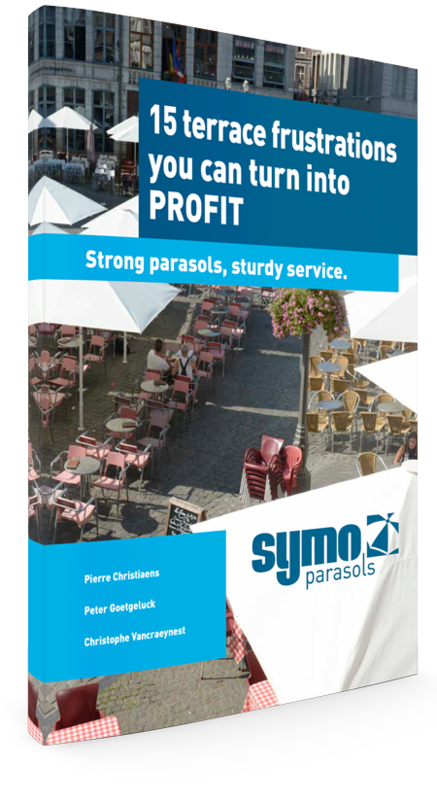 How you can transform the parasols on your terrace from a source of frustrations into a source of revenues. The solution for more turnover in changeable weather. How you can profit from a contribution for advertising without committing an offence. That one golden tip that will ensure that the service on your terrace is more efficient. Why passers-by choose your neighbour’s terrace instead of yours. How you can avoid (expensive) damage to your terrace floor. How to prevent accidents (with children). What to do with your parasols in winter. How to save costs when expanding. life without a care and in comfort. In addition, we aim for extremely high satisfaction of both our customers and employees.